The Notting Hill Carnival can trace its roots back to the first Caribbean carnival held in Trinidad in 1833 to celebrate the introduction of the Abolition of Slavery Act. The freed slaves, previously banned from holding their own celebrations, celebrated by singing and dancing through the streets. Some dressed up in costumes with faces whitened with flour like their previous slave owners, thus the tradition of dressing up in costumes and dancing and parading through the streets was born, commonly known as Mas, it derives from this masquerade. Claudia Cumberbatch Jones (1915 -1964) was born in Port of Spain, Trinidad but raised in the US and is often referred to as 'The Mother of the Notting Hill Carnival.' She lived in Harlem, New York from 1923 to 1955 and whilst there became a prominent black nationalist, political activist, community leader and journalist. She was an accomplished public speaker on human and civil rights travelling to China, Russia and Japan as well as all over America, who spoke out about against injustice and was leader in several major movements including the African American Liberation Movement and the Caribbean fight for Independence and Unity, she worked closely with civil rights and religious and immigrant organisations. Frequently harassed, threatened and spied on, Jones was eventually imprisoned four times whilst in America and was denied US citizenship. On her release she was deported and was eventually granted asylum in Britain. Many people sent messages of support and many others gathered at her hotel to see her off. In the UK Jones became an anti-fascist and anti-racist campaigner and in 1958 she published the first edition of the West Indian Gazette, the UK's first black newspaper. Jones was adamant that a community which wants to be heard needs its own voice. Many world leaders visited Jones at the Gazette office including Norman Manley of Jamaica. There had been a large movement of West Indian settlers to the UK in the 1950's and Jones found a society where there was open social, housing and employment discrimination. It was common to be greeted by signs saying 'No Blacks, No Irish, No Dogs' when looking for accommodation. 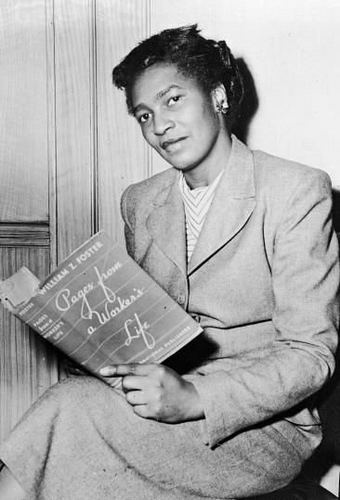 Claudia Jones with her former experiences in the US became an ideal spokesperson and activist to deal with the discrimination faced by the West Indian community. Race riots broke out in Notting Hill over the August bank holiday in 1958. Several racist organisations had moved into Notting Hill such as the White Defence League and followers of fascist Sir Oswald Mosley. The West Indian community in Notting Hill numbered 7,000 at the time and running battles between them and racist gangs lasted four days and nights. During these riots a young Antiguan man called Kelso Cochrane was murdered, and Jones was amongst the first to defend the black community along with Amy Ashwood-Garvey (the wife of Marcus Garvey.) After the riots Jones organised a walk from Powis Square, Notting Hill to Tavistock Square to highlight positive aspects of Caribbean culture, although the walk contained dancers and steel drum players it was not an official carnival. The Caribbean community wanted something to celebrate its arrival in Britain, a symbol of hope and understanding. Claudia felt that a Caribbean style carnival would be the answer, and organised this a few months later. The first UK carnival, known as Mardi Gras and organised in Notting Hill was held in 1959 in St Pancras Town Hall, the slogan was 'a people's art is the genesis of their freedom'. It was hugely successful and in 1962 Jones introduced the first Mas costume competitions. Carnival was eventually transferred to Notting Hill in 1964 with the help of a social worker called Rhaune Laslett. Unfortunately Claudia Jones did not live to see her dream of a full Caribbean style outdoor carnival realised. She died on December 24th 1964. Her funeral in January 1965 was attended by thousands and she was buried in Highgate cemetery next to Karl Marx. 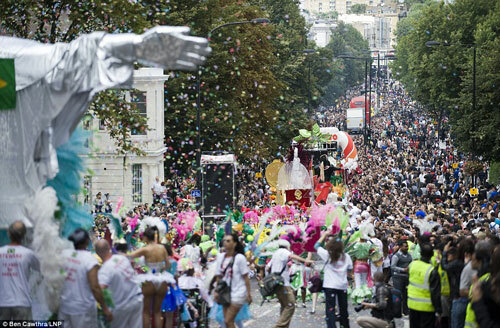 Skip forward to 2013 and the 49th Notting Hill Carnival is now the largest street festival in Europe with millions attending over the August bank holiday weekend and the second largest carnival in the world after the Brazil carnival held in Rio De Janeiro. From such humble beginnings the Notting Hill carnival is estimated to contribute around �100 million to the London and UK economy and is one of Britain's biggest cultural and tourist events. It is attended by an estimated one million people over the two days. The Notting Hill Carnival is a lasting testimony to the vision and determination of Claudia Jones. Respect to C.J, but once again what ever we create as black people slowly but surely gets taken over by THEM and I can assure you that C.J. would role in her grave if she knew what it has become, its unrecognizable and is more like Glastonbury than any west Indian or Africa carnival its disgusting, and needs to be returned to its roots. I have been going to the carnival for decades not any more. We are here to do whatever we can to keep our traditions and customs of our Nation. Thanks for the insight. I love it and God bless us. WoW what else can i say to such an ambitious and courageous woman, we really needed and still do need power and blessed women like Claudia Jones she definitely sets an example and is a role model to many women. WE salute our mother Claudia Jones for setting a foundation as the VOICE for our black people that were oppressed severely. May her soul rest in peace. The ED resulting from that surgery can be either temporary or permanent. However, it is important to get the doctor's opinion first before you take these oral medications because they may have bad side effects for the body.